May 20, 2014, 4:20 p.m. Ahead of this week’s European Parliament and local elections, UKIP leader Nigel Farage has repeatedly had to defend his party – and himself – against accusations of racism and bigotry. In a recent interview he characterised the source of the attacks as “a political class, clubbing together using their mates in the media and doing anything they can to stop the UKIP charge”. 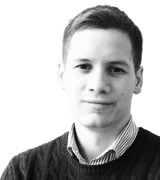 Views about UKIP and race have been decidedly mixed in YouGov’s recent polling: while most think the party seems to attract people with racist, extreme or odd views, the public disagreed with criticisms that UKIP’s campaign adverts were themselves “racist”. The latest YouGov research suggests that when it comes to the news media coverage about UKIP, many British voters agree with Mr Farage’s general view. 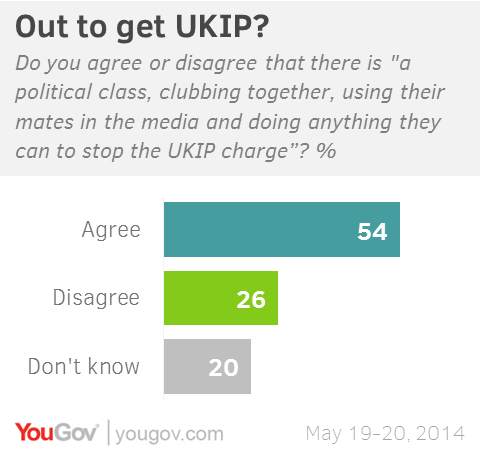 In fact, by 47-13% voters say the news media is biased against UKIP rather than in favour of them. Another 20% say news coverage of UKIP is basically fair and balanced, but the strong overall tilt towards a negative bias is unique to UKIP among the major parties. 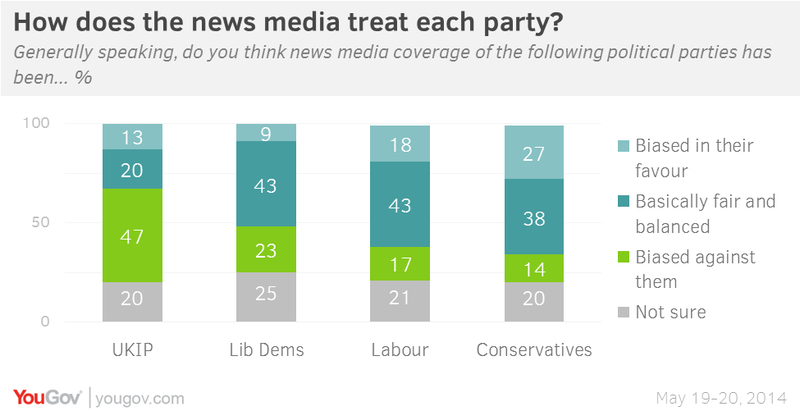 Interestingly, the tendency to see coverage as biased against UKIP is largely non-partisan. Majorities of UKIP (77%) and Conservative (53%) supporters take this view, as well as pluralities of Lib Dems (31%) and Labour (40%). Voters are more likely to say coverage of the Lib Dems is biased against them (23%) than in their favour (9%), but the most common perception is that coverage is basically fair (43%) for the party. “Basically fair and balanced” is also how the largest groups described news coverage of Labour (43%) and the Conservatives (38%). In addition, the public generally agree with Nigel Farage’s own assessment that UKIP is being victimised by “a political class” and “their mates in the media”. The majority (54%) of British adults agree with his statement, while only 26% disagree. 20% don&apos;t know. It’s unclear what impact the recent media criticisms of Mr Farage and UKIP are having on their prospects for the elections later this week. YouGov’s latest voting intention poll for the European Parliament election has UKIP gaining three points from the previous poll to tie Labour at 27%.